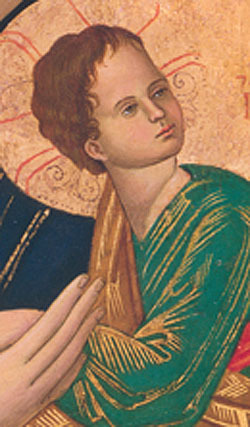 Jesus, pictured as a young boy, also wears the colors of a king. His gaze is directed neither toward the beholder nor toward the angels who seem to frighten him with a foreboding of his bloody and bitter Passion. His wide-open eyes are gazing fixedly into space. On his face are signs of attention and serious contemplation.